DoBee Plaisance calls out instructions to her players during a game. Rick Yeatts/Matt Pearce photo. In her tenth season as Nicholls State University’s coach in 2017-2018, DoBee Plaisance guided the Colonels to their first NCAA Tournament appearance in program history with a Southland Tournament Conference victory. Her tenure began with a two-win year, and within three seasons, Nicholls State evolved into a league contender. Plaisance has led her teams to nearly every single program record, and notched a Colonels-best 121 wins going into this year. She began her collegiate coaching career at Loyola University New Orleans, where she turned the program into an NAIA powerhouse over 13 years. She was inducted into the Loyola Athletics Hall of Fame in 2015. 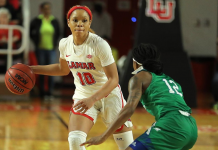 A New Orleans native, Plaisance was a four-year starter in college, playing two years at the University of New Orleans and two years at Southeastern Louisiana University. 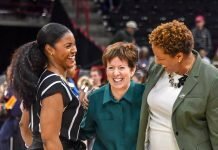 Following a stint with Southern Miss, she joined the Tulane University staff as assistant coach, where she spent three seasons. 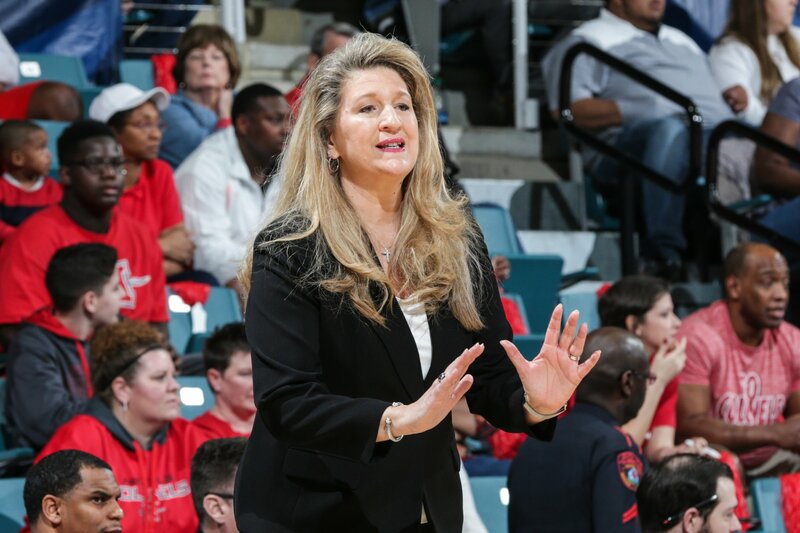 Plaisance began her head coaching career at St. Martin Episcopal High School in Metairie, La, where she created a dominant program over eight years. Both of Plaisance’s children, Theresa and Scott Jr., have followed their mother’s footsteps into basketball. Theresa Plaisance was a standout forward at LSU and was drafted into the WNBA in 2014, and Scott is a senior forward at the University of New Orleans. Going back to last March, did you see that NCAA Tournament run coming for your team? In the moment, the day I walked on to this campus, we were the worst team in the country, literally. When I walked on to this campus I said, “I will not leave until we win a conference championship and we get to an NCAA Tournament.” I saw it for years – it just didn’t happen for a while. What did you and your athletes learn from that experience? I’ve always believed that when you fight the good fight and do the right things, there are never losses, just lessons. Whenever you do anything in life, it’s about preparedness. In that moment, we were prepared. We had to claw our way to get (a first-round conference tournament) bye, and when we took the floor to play, we were ready. We also took on a mantra last year, and it might sond crazy. But for example, I told them that I don’t want you beating Lamar; if you say that, then you’re not thinking right. It’s: what do the Colonels have to do to win? If focus is about beating their behinds, then they’ve got you. Our focus needs to be on us. We had a six-game losing streak in the middle of conference play, and things were looking pretty dire for a while. But we kept our heads up. You’re going to play for me if you’re positive, a good teammate and you bring energy. I don’t care for negativity, even if you could bring me a championship. I’m not saying we’re perfect, but our intentions are good. Did last year’s success change your approach coming into this season? It didn’t change it at all. Since I walked on campus, I’ve said we’re going to act like champions, prepare like champions, and we’re going to win. But I can tell you that while my approach was the same, it took on a different meaning. During our summer workouts I wold tell them, “we haven’t done anything – we haven’t done a darn thing.” They’d look at me like, “really, coach?” I’ve always wanted to do my best to empower my kids. If what was good today worked, then you better figure out what will work tomorrow. I am still giving them the same message, but it took on a new meaning this year. How do you build a program from the ground up, as you have? I am a strong woman of faith, and I believe that this game is not that complicated. I think championship teams are built with a foundation of solid defensive systems. But this game, or any sport, is won with team culture that is created. That’s where my focus was, in getting the type of players who would normally wouldn’t give Nicholls the time of day. I don’t have a recruiting budget, and I only have two assistant coaches. If look at what you have and believe you have enough, you work harder and smarter, and then you get better. It’s my job to figure out what’s the lesson, what is God trying to teach me, where do I need to grow. It is God’s plan, God’s timing. I had some talented kids come through who felt entitled to play, but if they weren’t doing the right things, I wasn’t playing them. I was ever desperate to win, but I was eager to create a positive culture. I was always trying to get positive team mindset, and winning was going to be the repercussions of it all. I wasn’t focused on winning, but on process. If I walked into a Nicholls State practice today, what would I see? You better see energy and effort, or you’re going to see them running down and back, and I don’t care if it’s the day before a game. What is the most important thing your team does in practice every day? Doing everything with togetherness and cohesiveness. I’m a stickler for details and little things. I OCD if you’re shirt is untucked. I OCD if you’re not talking on the floor. The littlest things drive me crazy. From jump ball, all that matters is the possession we’re on. I always had an interest in medicine. I’m a numbers person and I wanted to be a nurse like my nanny. My master’s degree was never completed because coaching came in to play. I was in a cardiac rehabilitation program, and when I was still playing ball I had the chance to coach right away. I was at Tulane, and they gave me an assistant coaching position, and I caught the coaching bug. At the end of the day, if I can’t make a difference I’m miserable. I want to affect people and serve people in a good way. That’s why I got into college coaching, Then I thought that the high school level is where I could make a difference, and I thought I was never coming back (to coach college). I said, if God wanted me back to college, He would bring me back, and He did. What kind of a player were you, and how did your own playing career influence your coaching career? I was brought up (playing for) some really tough coaches, and I was a very aggressive player. When i played at Southeastern, they called me the Hammond Hammer. The (coach at Southeast Texas) told me my elbows needed to be registered with the FBI as legal weapons. was very physical and would take a charge in a second. Any rebound remotely close to me, I owned. Toughness is a choice. There’s a difference between being injured and being hurt. Some want to go to a doctor for a hangnail. Discipline is tough, accountability is tough. Don’t come in here and tell me you can’t do it. How did both of your kids come to love the sport as much as you do? What does your “basketball family” look like? I wasn’t going to be one of those parents that was going to pigeonhole their kids. I had Theresa in karate, gymnastics pottery – everything. Scotty, not so much because Theresa was four when he came along and I didn’t have as much time. But he played baseball, football, and they both played soccer. It was going to be God’s plan if they migrated to basketball, and they did. Theresa was recruited in volleyball and had some nice offers. Scotty was a heck of a baseball player, and his high school baseball coach said if he put a little more time into it he could get drafted. For many years we were juggling baseball and travel basketball, and they had to make a choice, Honestly, I held my breath. But now, to have two kids doing what they love – there’s nothing better. 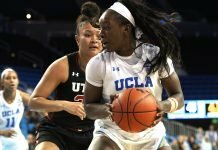 What did it mean to you to see Theresa drafted into the WNBA? I was so humbled, so humbled. The first time Theresa was invited to the USA Basketball trials, there were 38 invites and they had to get the roster down to 12. I was watching them and thinking that I’d have to pump her up, because there was no way this child is making the team. Little did I know, she made the team. When she was drafted, it was another blessing, and now she is one of the Dallas Wings’ guaranteed players. What do you love about coaching at a small school? The ability to make a larger impact. You have to do so much more, and i think it’s awesome. It prepares me for the next day. If i was good today, I better figure out how to be great tomorrow. There are so many benefits to coaching at a mid-major, if you look at the big picture and really appreciate it. Anywhere you go in life it takes all kinds, and if you didn’t have mid-majors, you wouldn’t have the BCS schools. One day you will retire from coaching. What will you do then? I’d like to be either a life coach, making a difference, volunteering somewhere to be around kids, or at church. Maybe a consultant. I love kids, and I love the elderly, so I’d like to help them. I am not a sit around the house person. If you could go anywhere on earth for a one week vacation, where would you go? I’m about God, family and education, and I would love to go to Barcelona, Spain – because that’s where my family is from – and look into my family heritage.